Hello, my friends! It’s wonderful to have you on Home Bunch today. 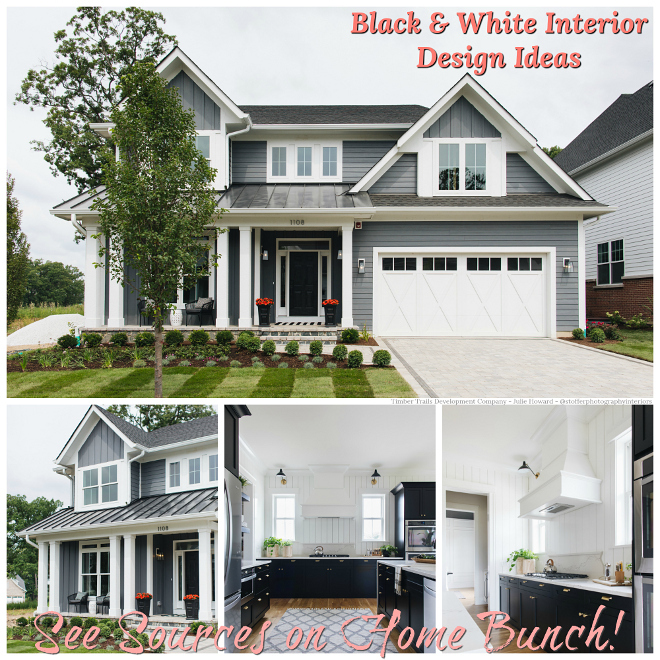 I am excited to share this newly-built home because I feel it has so many inspiring interior design ideas. 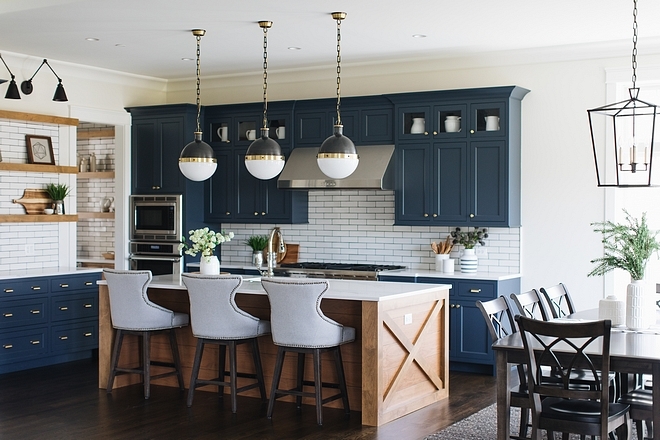 Located in Western Springs, Illinois, this family home was recently built by Timber Trails Development Company and with interiors by Julie Howard. 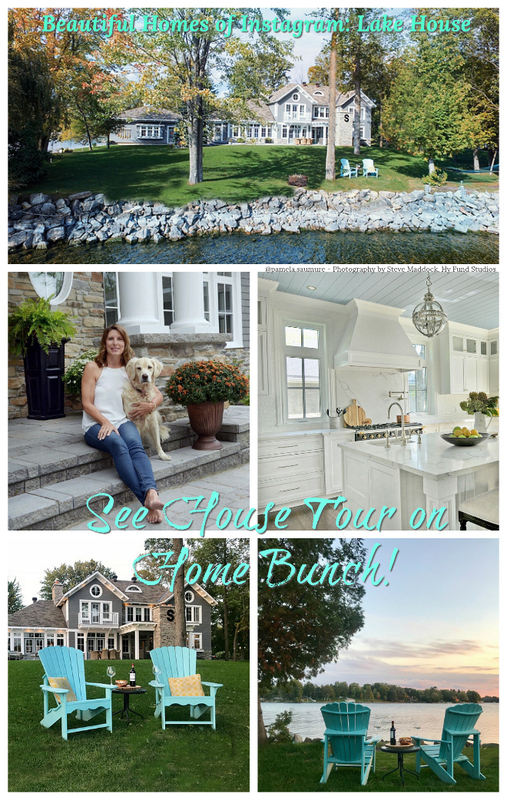 If you’ve read the blog for a while, you might recall seeing another home designed by them here not too long ago. In fact, that one has became a very popular blog post on the blog and on Pinterest. 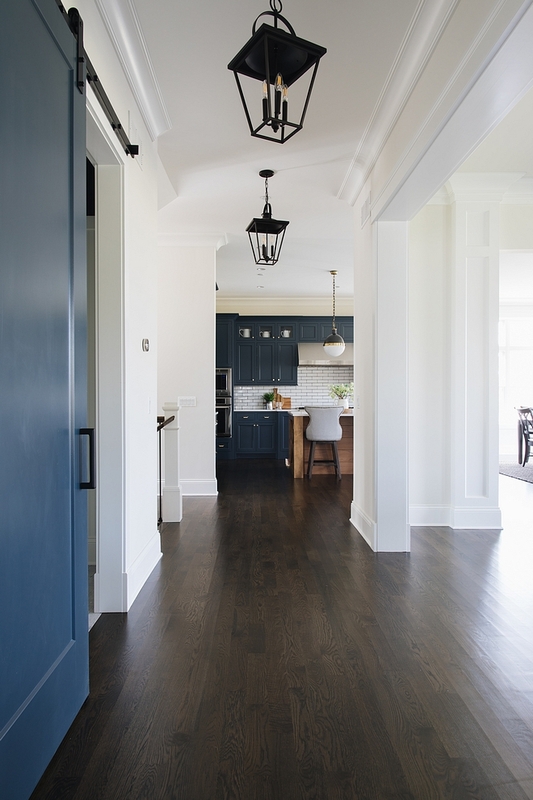 What I love most about this home is the navy blue kitchen and the millwork used throughout the house. I feel that these elements really create beautiful backdrops to the fine furnishings. Now, leave the world behind and get ready to daydream and get totally inspired by these beautiful interior ideas. Exterior Details: Siding and shakes are Hardie Grey Slate. The designer color matched the front door to the Grey Slate. 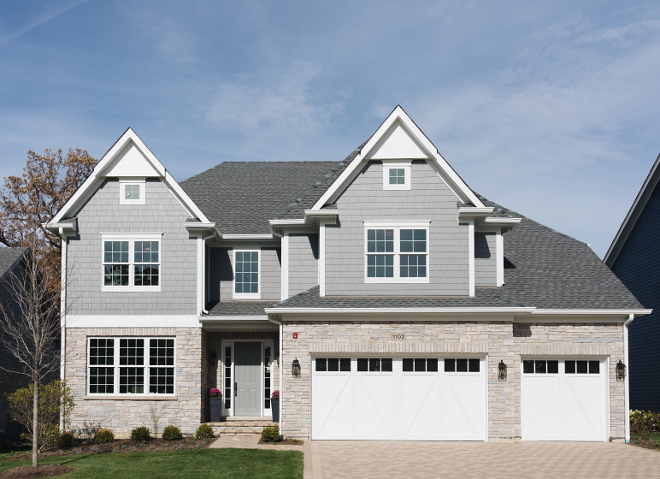 Trim is Hardie Arctic White. The stone is Blue River Select Gray. The brick is Aztec White and the shingles are Aged Pewter. Similar Front Door: Here & Here. Door Hardware: Here & Here. 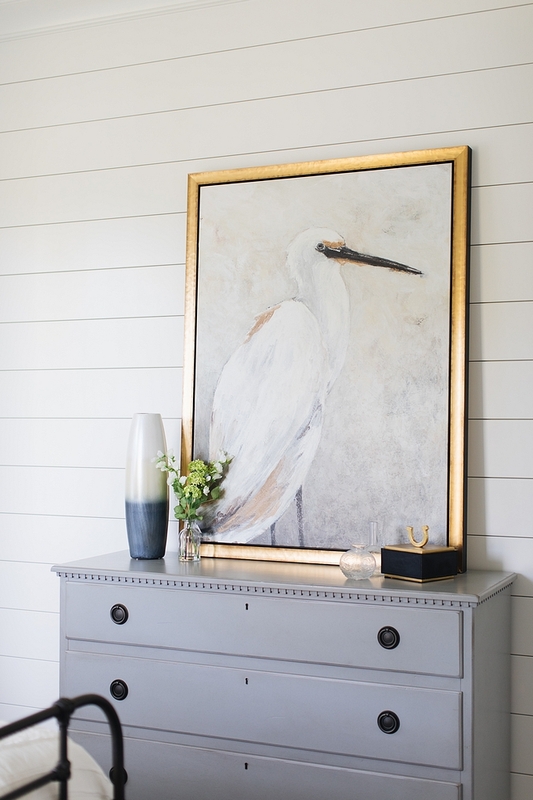 The foyer paint color is Classic Gray OC-23 by Benjamin Moore. 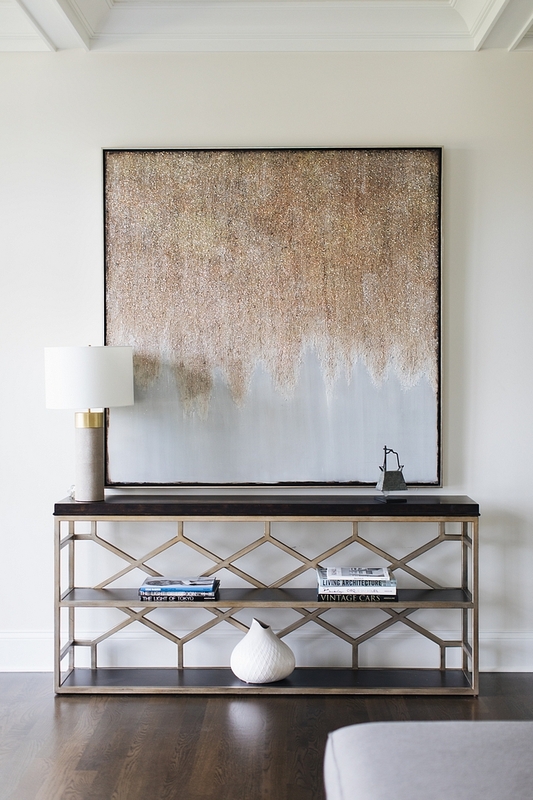 Console is Hickory Furniture Greenwich Console. 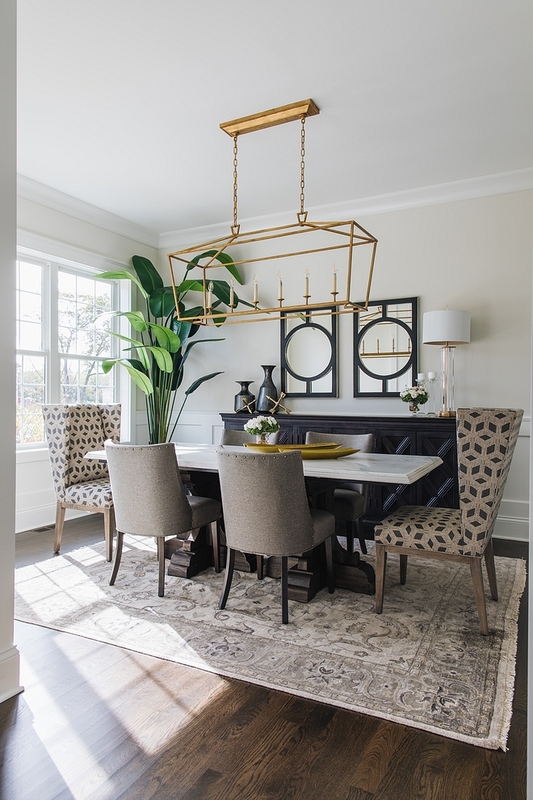 The dining room wainscoting gives it a classically formal feel but the gilded iron linear light fixture makes it fresh and inviting. 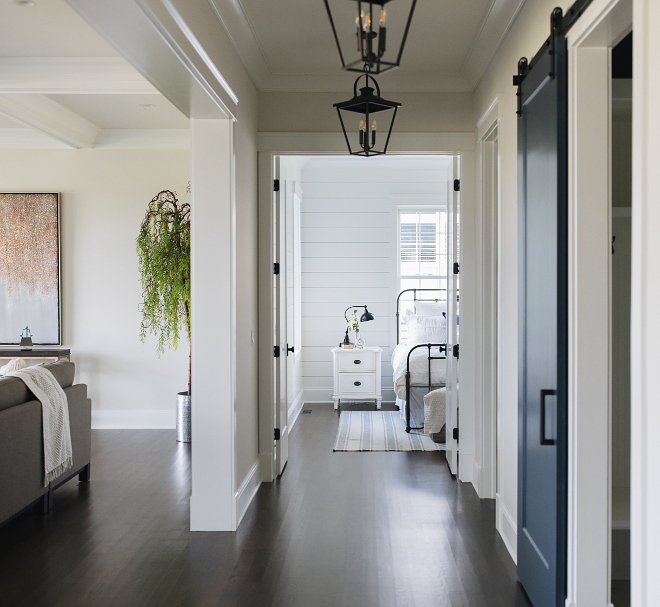 Paint color above wainscoting is Benjamin Moore Classic Gray. Long Sideboards: Here, Here, Here, Here & Here. 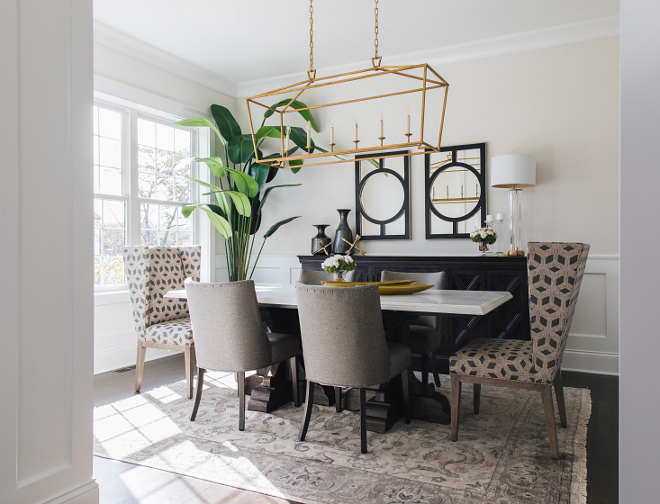 The dining table is from Walter E. Smithe – similar here. Timber Trails Development Company. Julie Howard. 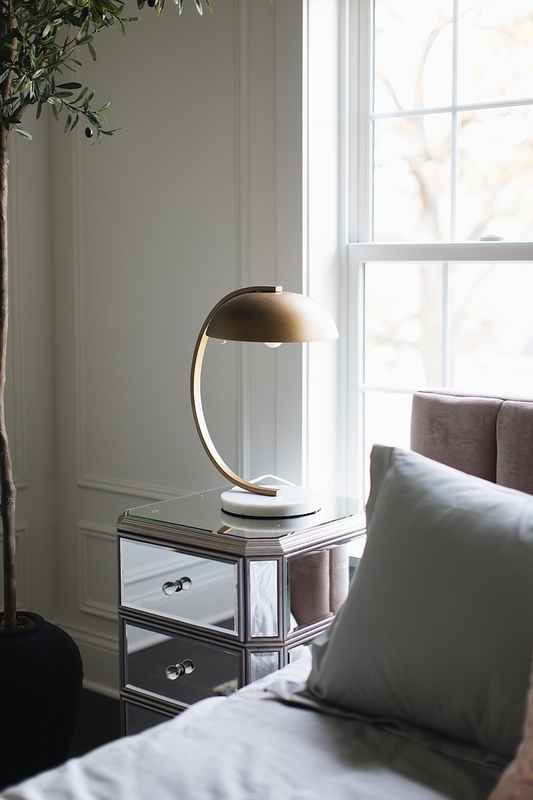 Similar Cylinder Table Lamp: Here. 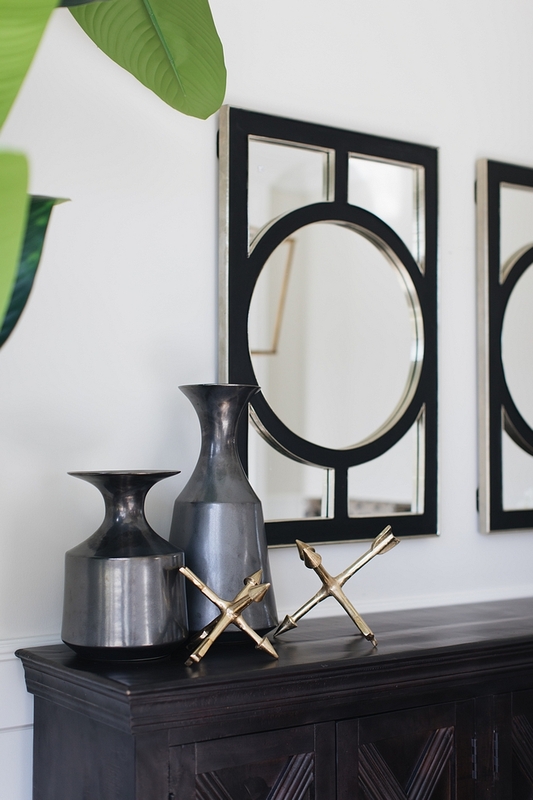 Find beautiful black mirrors here. 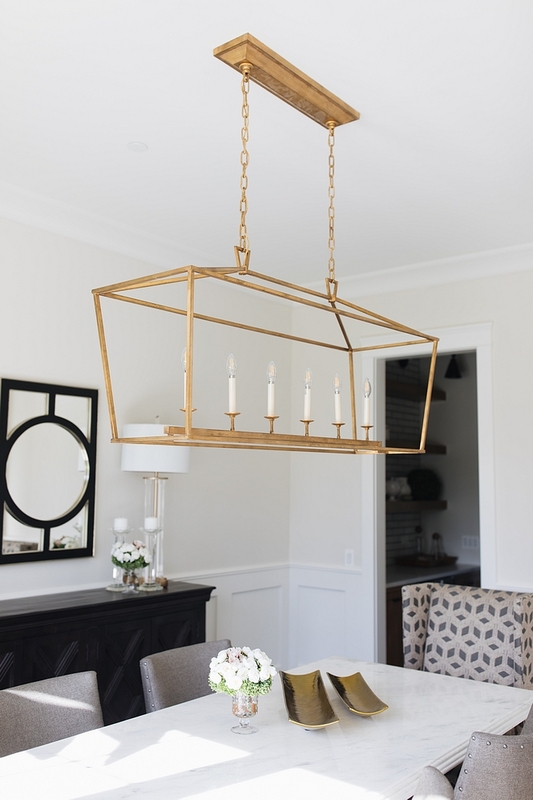 Dining Room Lighting: Visual Comfort Gilded Iron Linear Chandelier. 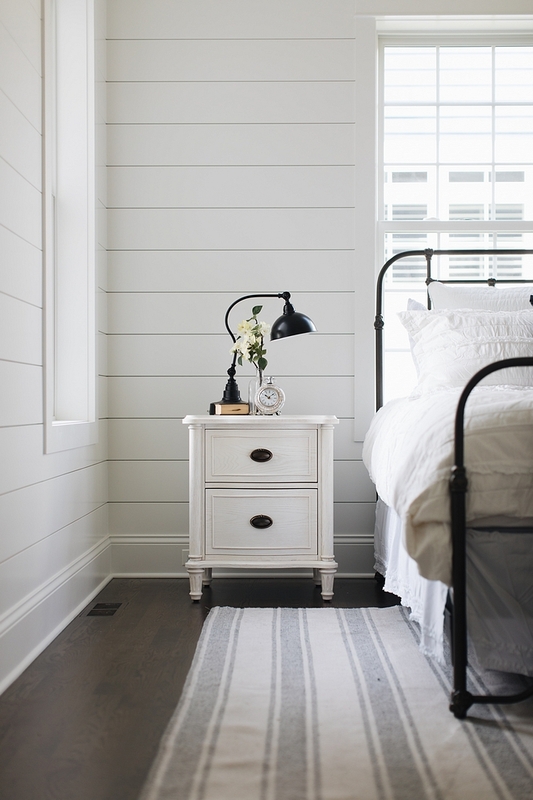 Trim and Ceiling Paint Color: Benjamin Moore “Simply White” OC-117. 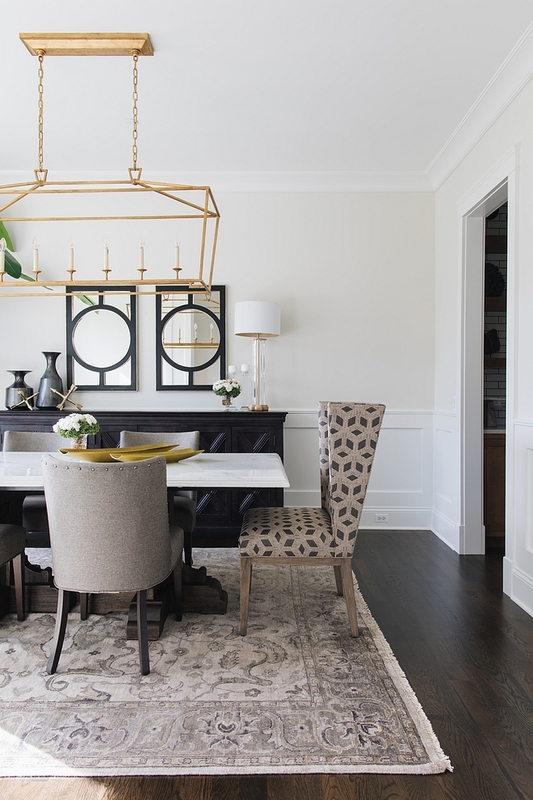 Host Dining Chairs: Walter E. Smithe – similar here, here, here, here, here & here. Similar Side Chairs: here, here, here, here, here & here. 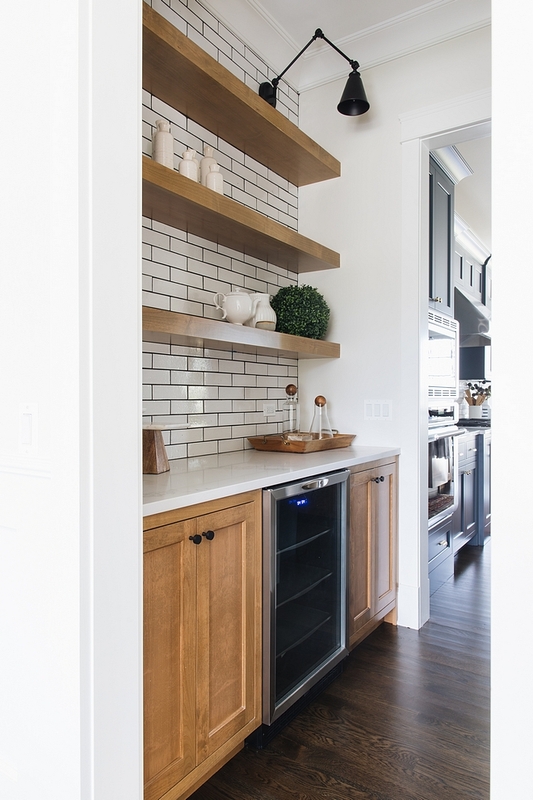 The dining room connects to the kitchen through a butler’s pantry complete with a bar fridge and open shelving. 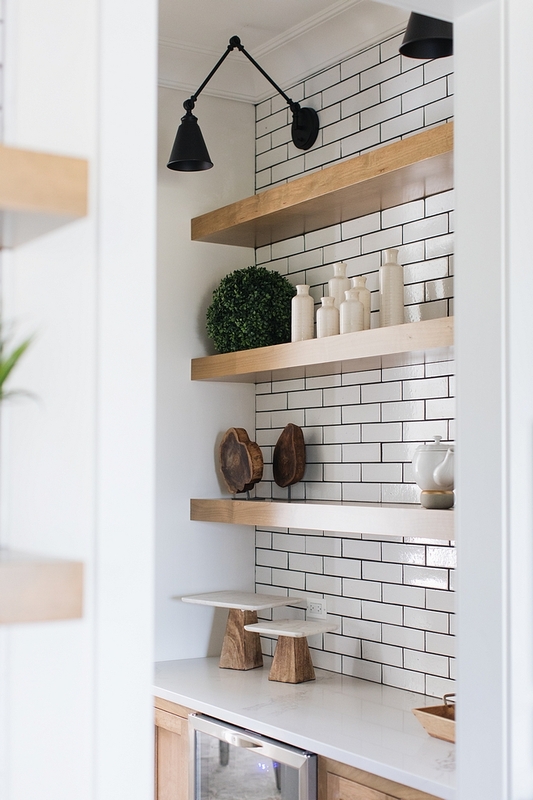 Floating shelves and butler’s pantry cabinetry are Hickory with a Natural Stain. 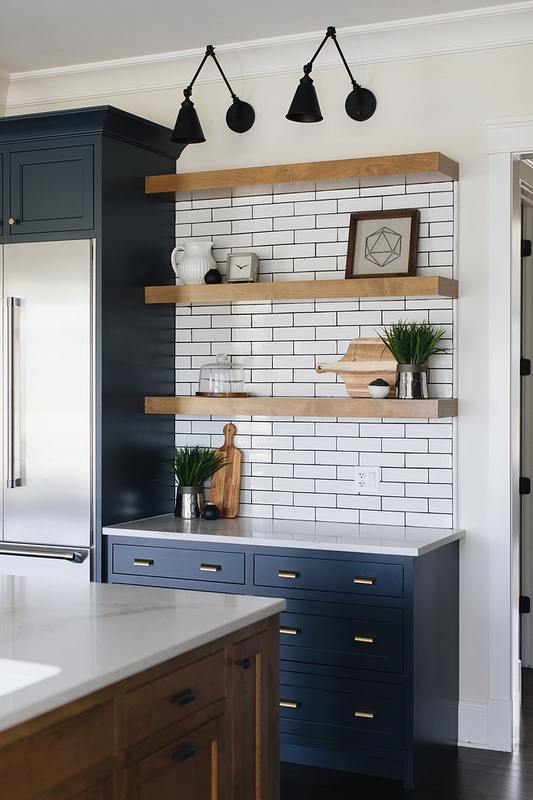 Kitchen decor are a combination of HomeGoods, Mcgee and Target. 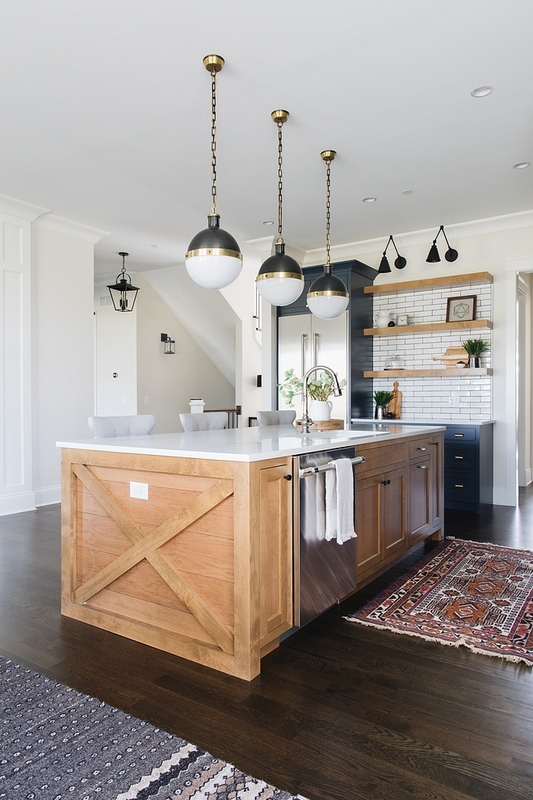 We had a few possible buyers come through and express that they were tired of white kitchens. Since that’s the majority of what we create, we thought we’d better incorporate some color and wood and see how it goes. 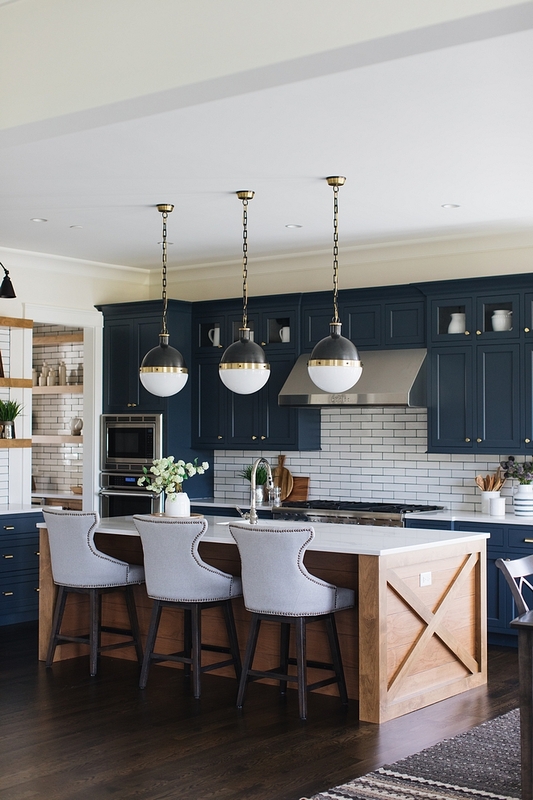 When choosing a color, Navy Blue seemed to be the right choice as it reads as a neutral. 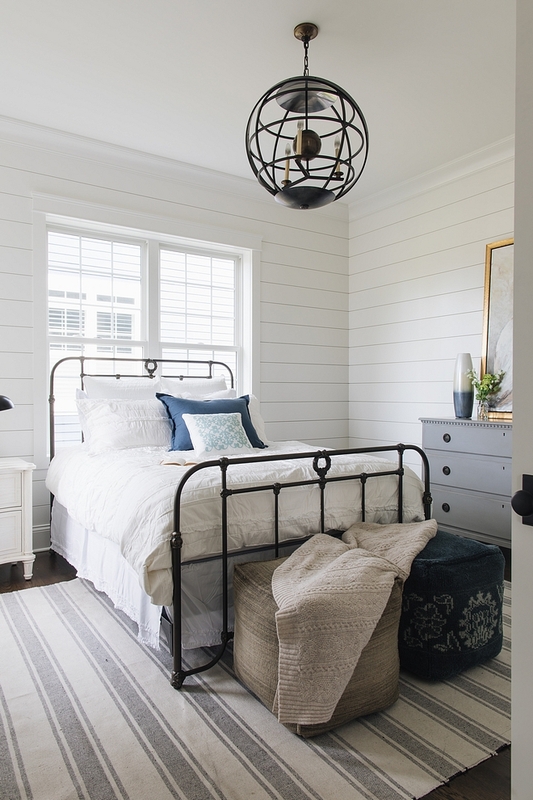 Navy goes with everything when you’re putting outfits together; navy works in interiors much the same way. 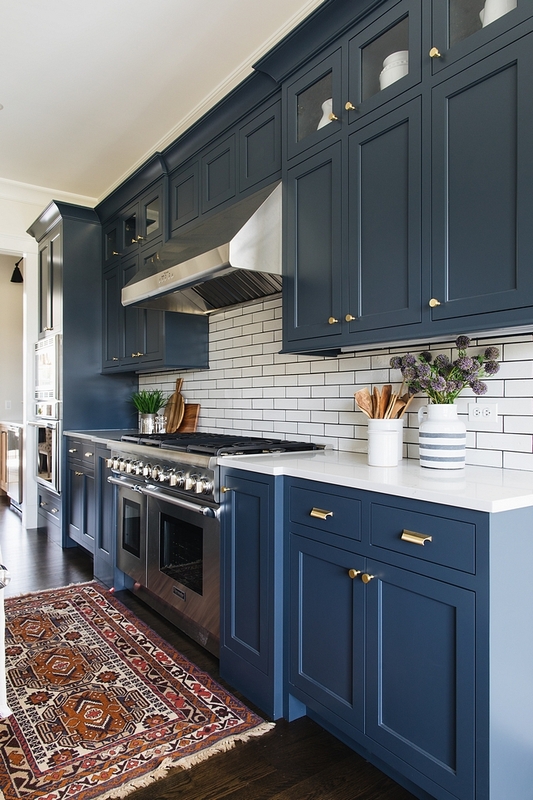 Navy is so easy going with other colors and styles. We couldn’t be happier with the result! 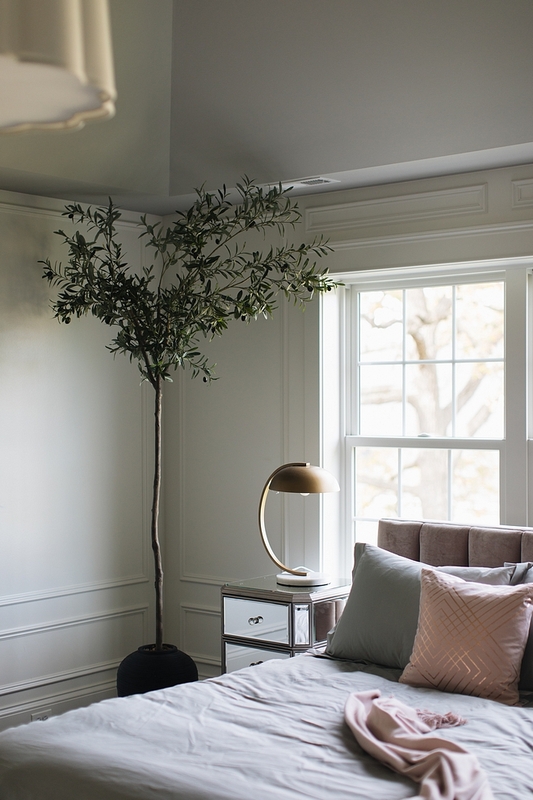 Wall color is Benjamin Moore Classic Grey OC-23. The kitchen has 4 ovens and is designed for someone who loves to cook. Appliances are all Thermador – Similar Refrigerator, Range, Ovens. 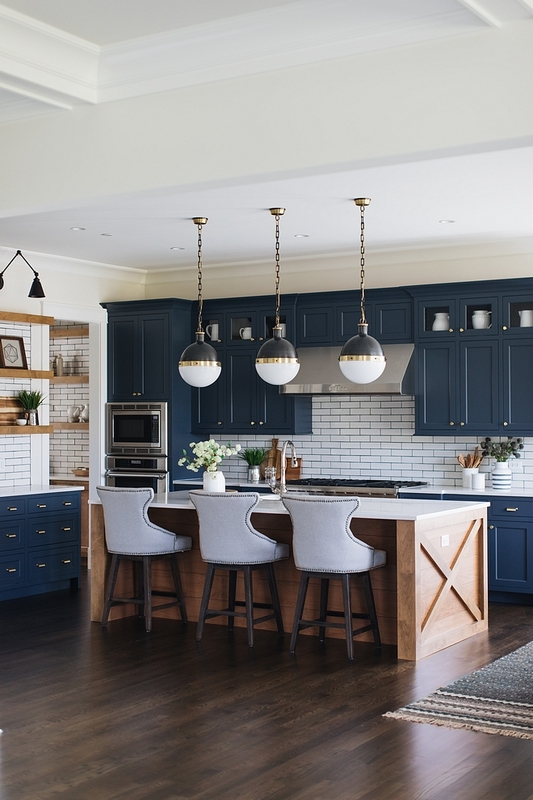 Blue Cabinets are Benjamin Moore Blue Note 2129-30. Kitchen Decor: Some decor in the kitchen are from McGee and Co. 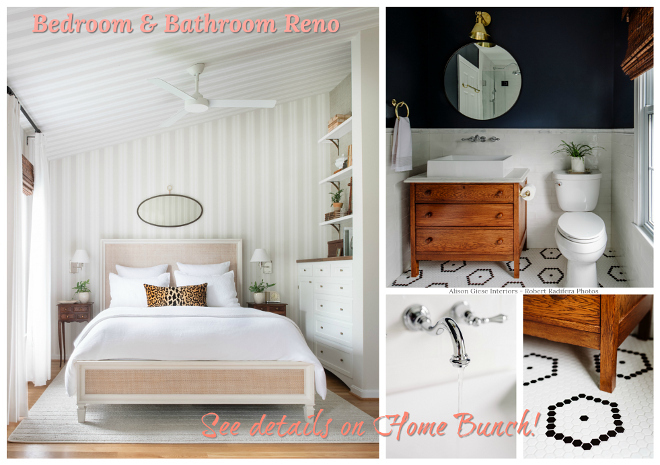 Kitchen Hardware: Schoolhouse Electric – Card File Pulls & Small Riverwood Knobs. 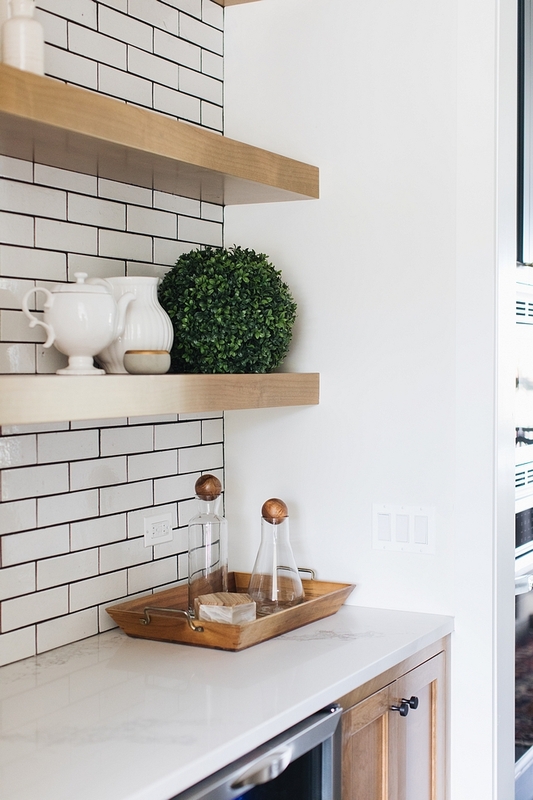 Backsplash: Bison Brick and it’s Glazed Terracotta. Similar Here, Here & Here (in light gray). 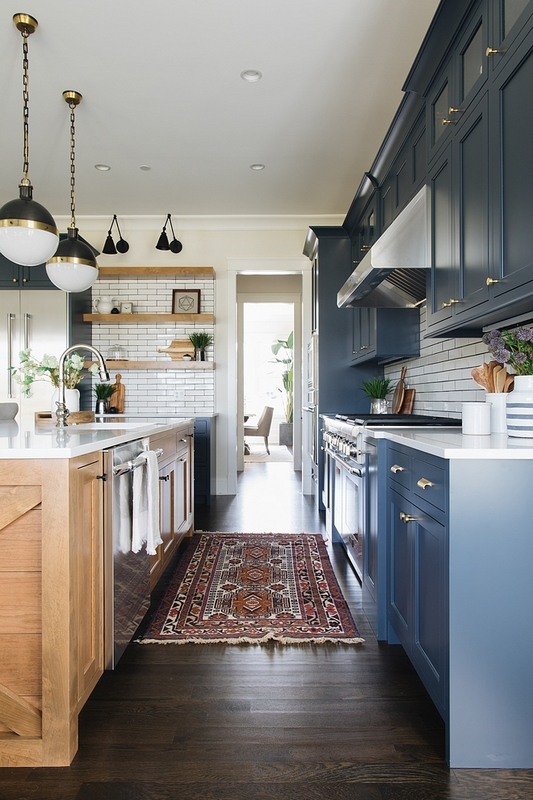 Kitchen rug is an antique from Persia from a local store – similar antique rugs & runners can be found here. The x with shiplap kitchen island is Hickory with a natural stain. 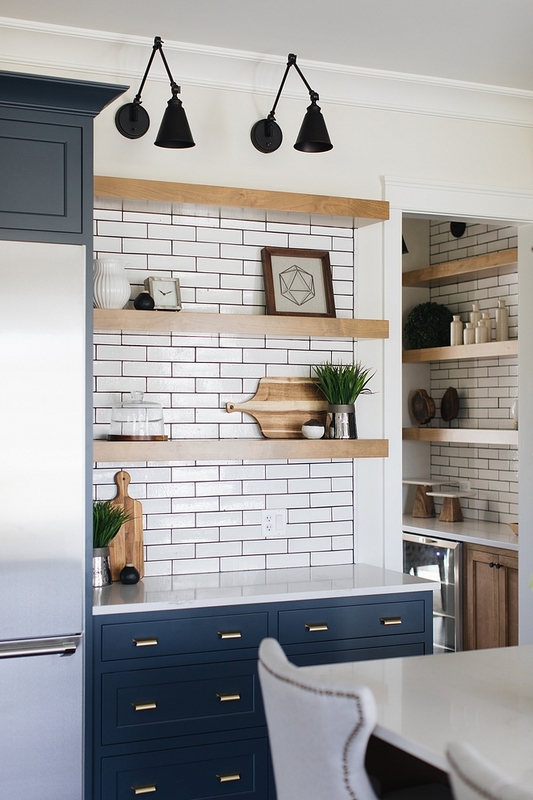 Similar floating kitchen shelves can be found here. 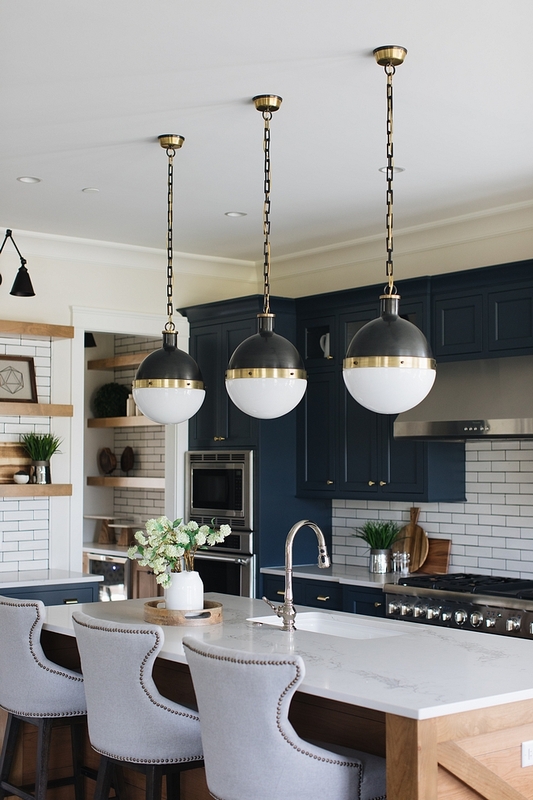 Matte Black Kitchen Sconces: Here. 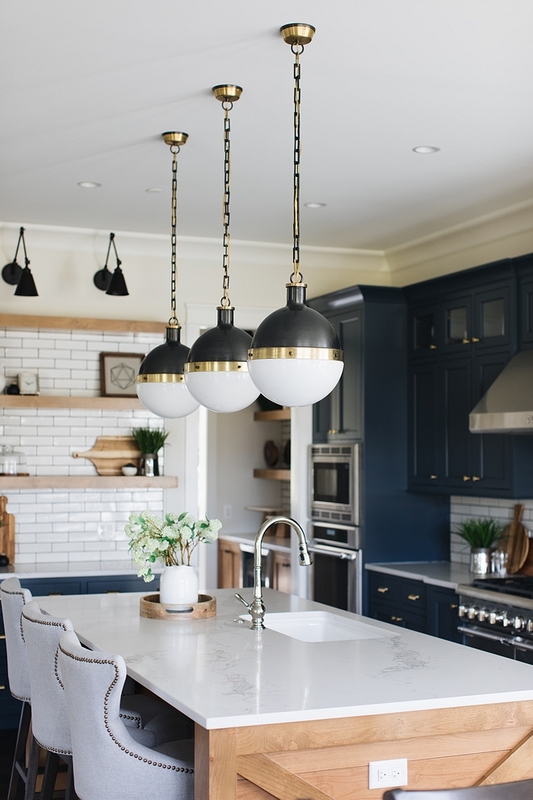 Kitchen Island Lighting: Hicks Large Pendant. 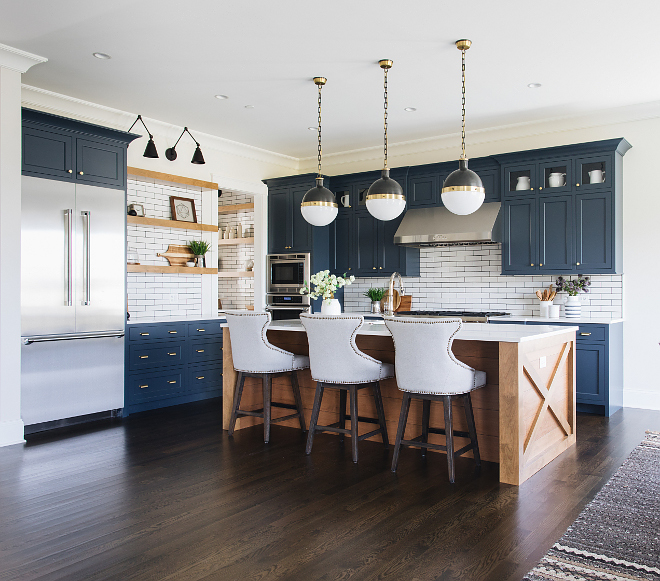 The kitchen features grey counterstools – similar here & here. Faucet: Kohler – similar here. 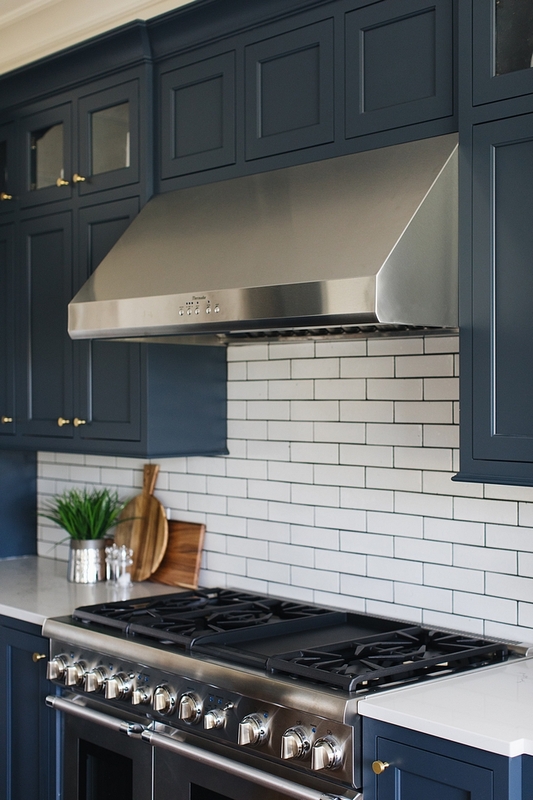 Do you ever wonder what to place on the top cabinets? 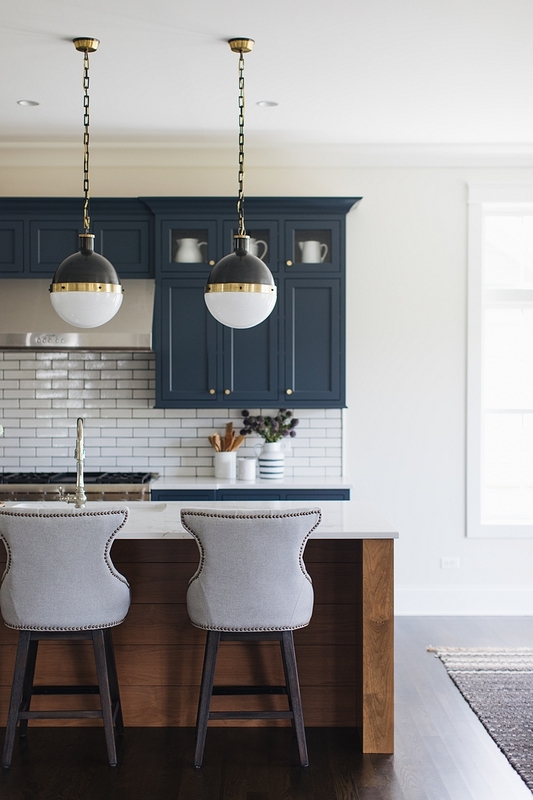 In this kitchen, the designer placed a single white pitcher in each glass cabinet. This draws your eye to it, plus it’s great storage for items not used all the time. Paint color is Benjamin Moore Classic Gray. 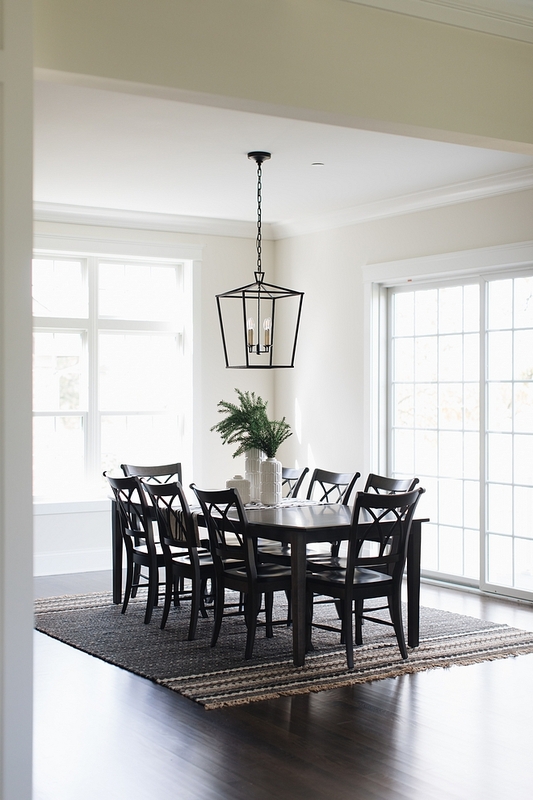 Beautiful Breakfast Room Dining Sets (Save $! )- Rectangular Tables: Here, Here, Here, Here, Here, Here, Here & Here. Round Tables: Here, Here, Here, Here & Here. This room is about 30×17′ with 10′ ceilings. It is huge! 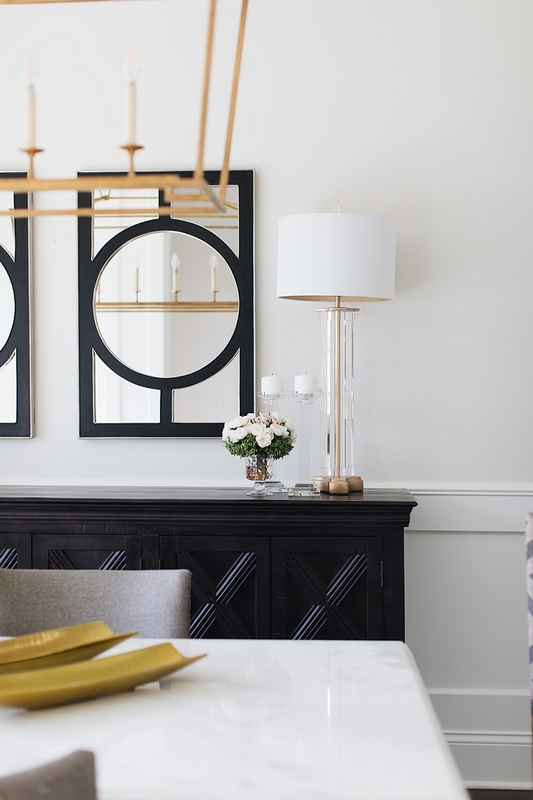 To bring detail and coziness to the large space, Julie designed a coffered ceiling and a fireplace mantel that drew your eye up to the ceiling detail. The cased openings surrounding the room also pull it in so the room feels cozy and not one huge open space into the kitchen. Sometimes just dropping a header and pulling wing walls in does the trick from turning an open floor plan that feels cold into a warm inviting space. Sectional: Jonathan Louis Logan 4 piece sectional – similar here: Camden 3 Piece Sectional. 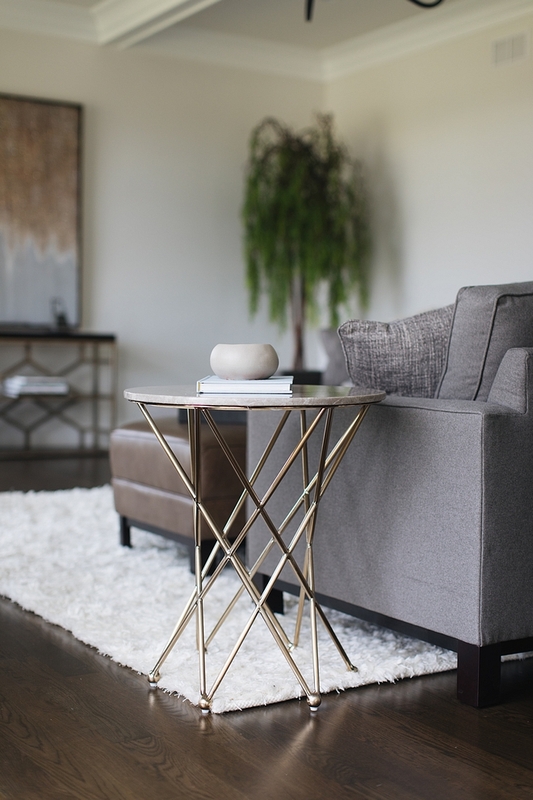 Similar Marble Accent Table: Here, Here & Here. The white shag rug can be found here. Walls are Benjamin Moore Classic Grey. 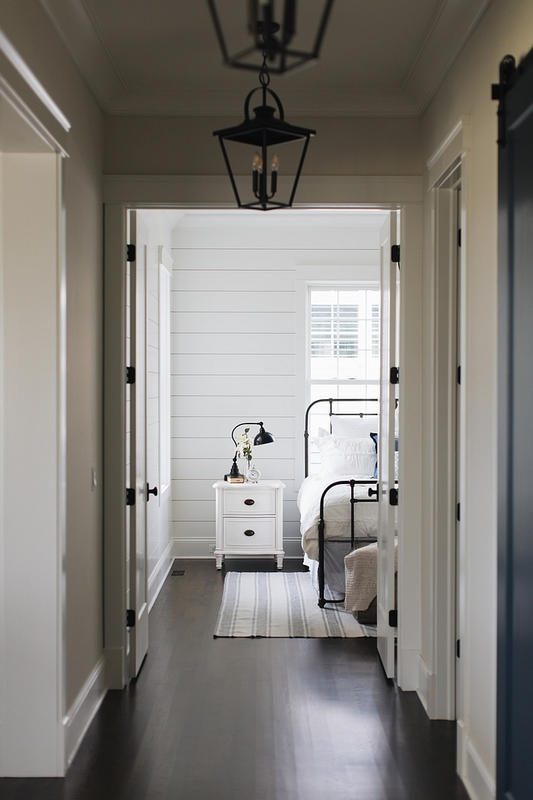 Ceiling between beams are also painted in Classic Grey OC-23. Similar Table Lamp: Here & Here. Similar Tile: Here, Here & Here. 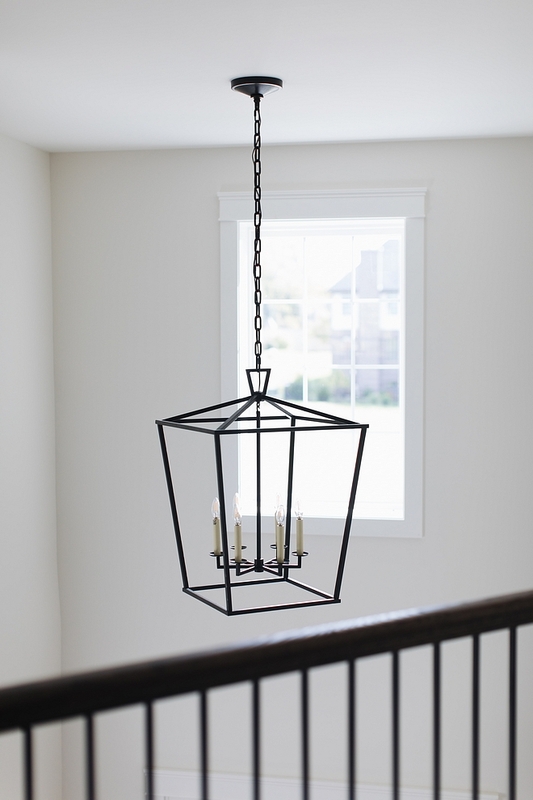 The designer added a few outdoor hanging lanterns in the hall. Similar Lighting: Here, Here & Here. 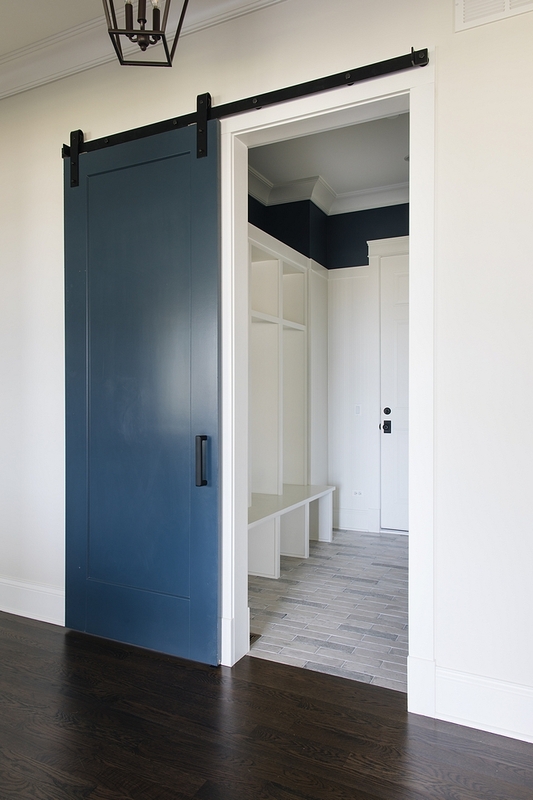 Mudroom Paint Colors – All Benjamin Moore: Beadboard Walls – “Simply White” Top of Walls – Blue Note 2129-30. Barn Door: Blue Note 2129-30. 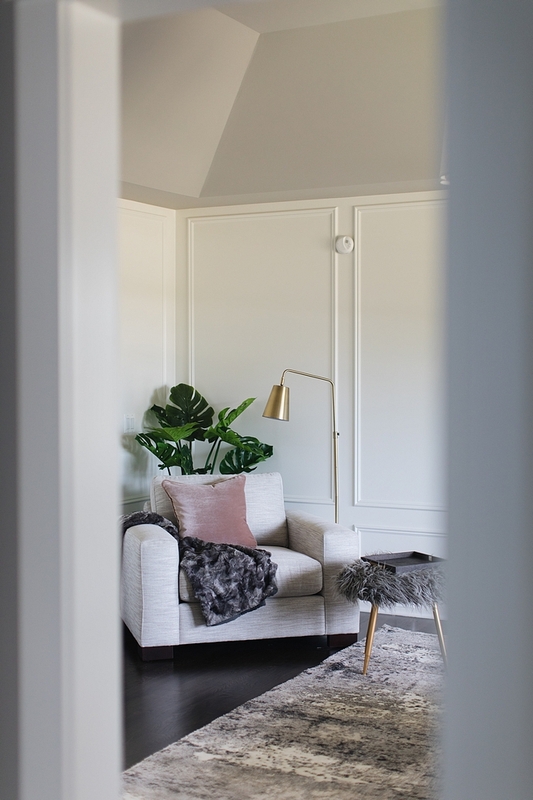 This space is on the first floor is staged as a bedroom because there is a closet and a full bathroom. It really could serve as an office or playroom as well based on it’s location within the house. Similar Rugs: Here, Here, Here. 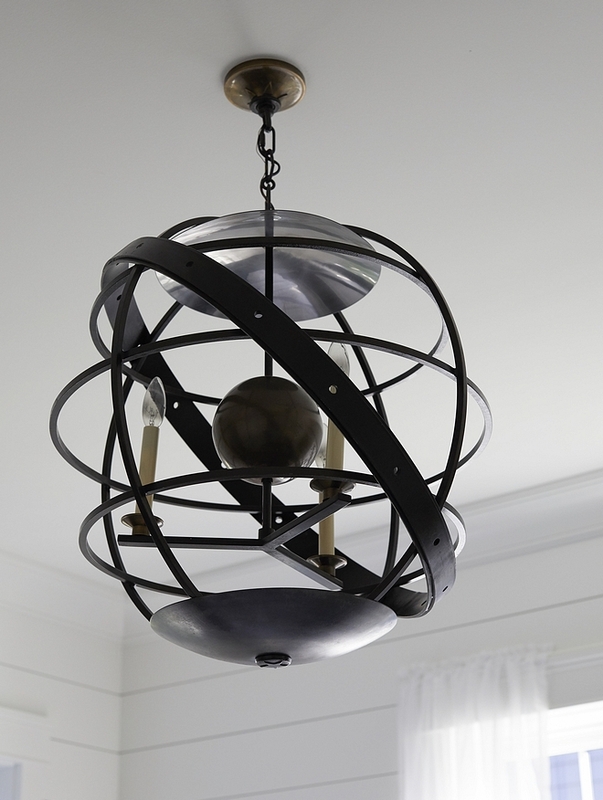 Lighting is Visual Comfort – discontinued – similar here & here. Rug is Loloi Rugs – similar here, here, here, here & here. 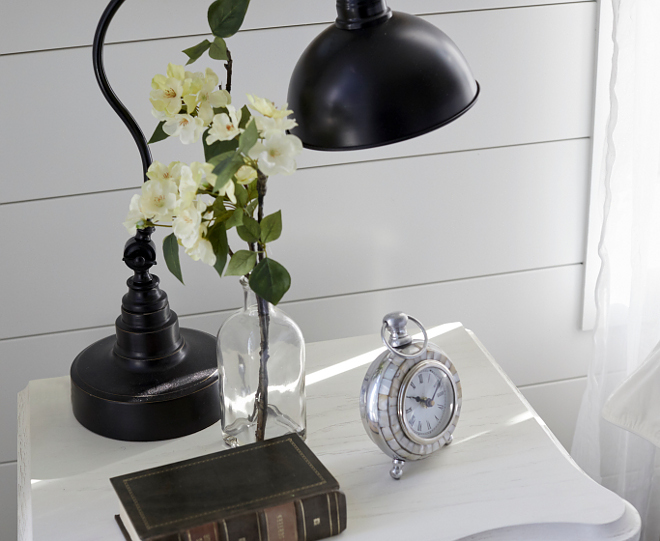 Keep it simple when it comes to nightstand decor. More is less! Nightstand: Universal Furniture. 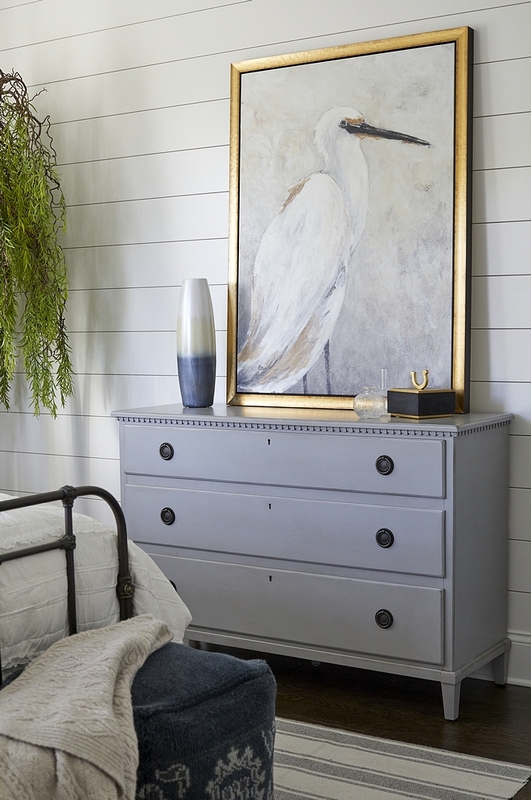 Complete the look: 6-Drawer Dresser, 4-Drawer Chest. Artwork is from Walter E. Smithe. Similar here. There are 6 bedrooms, each with their own bath in this house so giving them each their own identity was fun. 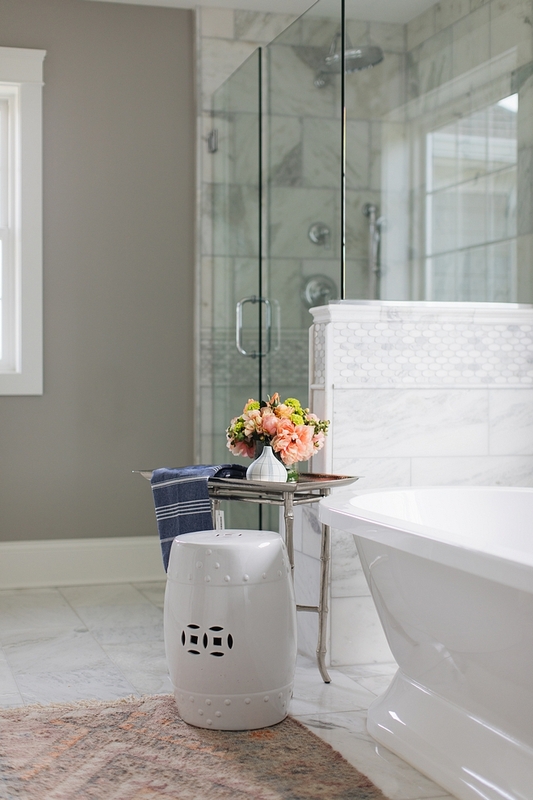 The first floor bath is simple in beveled subway tile and hex Carrara marble tile. 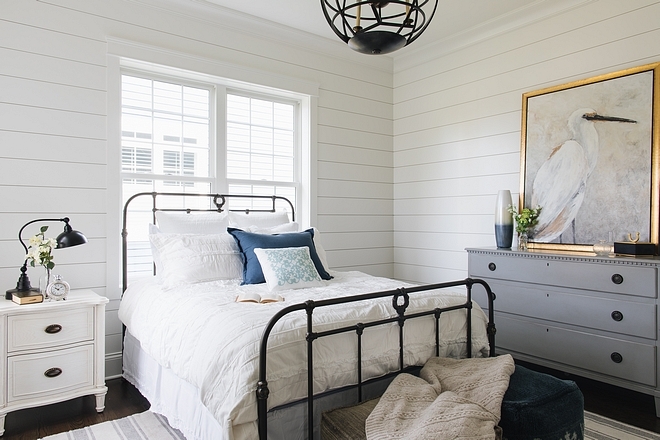 Paint color is Gray Owl OC-52 by Benjamin Moore. 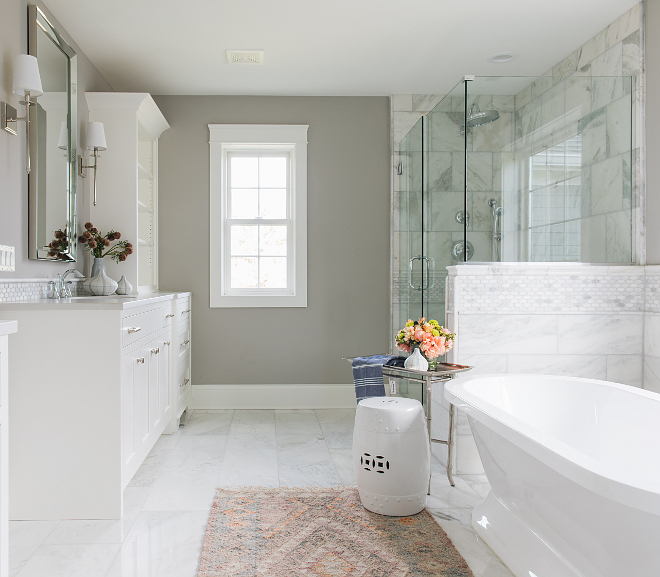 Another bath channeled greige and has a limestone-looking countertop and marble basketweave mosaic floor tile. Cabinet is from RH. 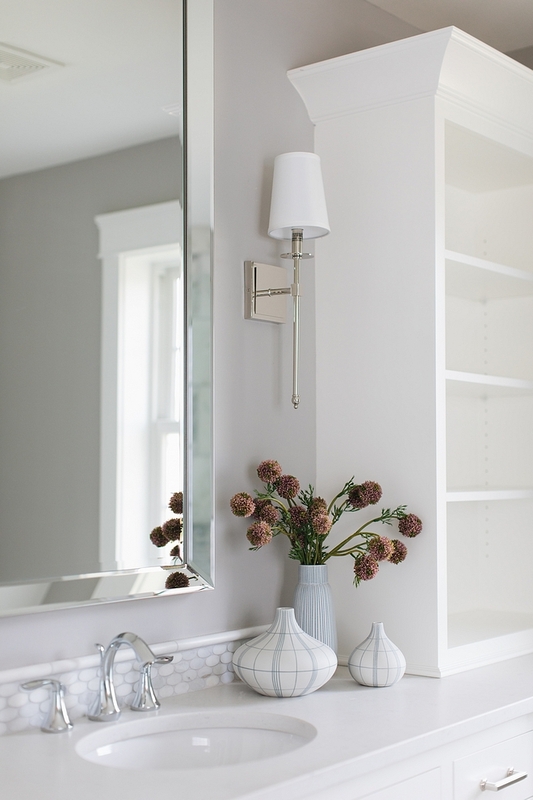 Wall color is Revere Pewter HC-172 by Benjamin Moore. Countertop is Caesarstone Classico Shitake countertop with 8” backsplash on back wall. This bathroom is a perfect combination of masculine and feminine with a dark wood cabinet from RH next to a Chevron Carrara marble floor. Countertop is Misty Carrera Honed. Backsplash is 8” tall with scallop edges. 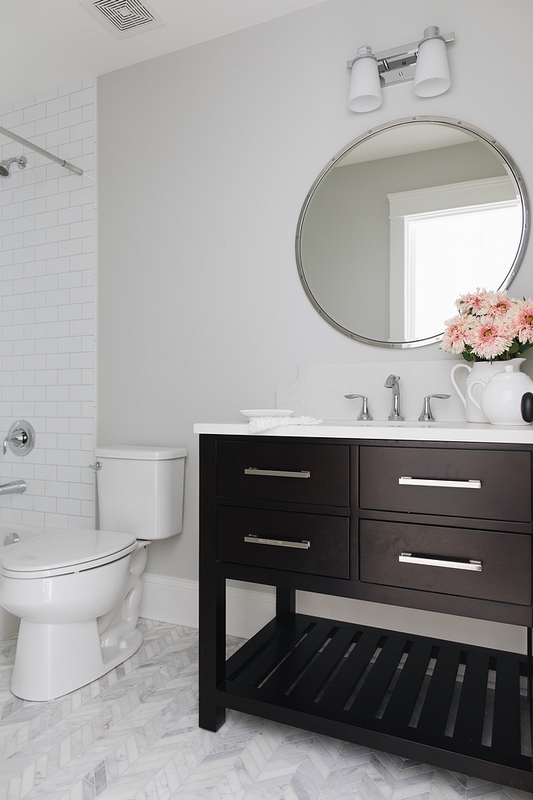 The Jack and Jill bath is rustic in wood, black and white. Wall paint color is Benjamin Moore Classic Gray OC-23. Backsplash: 8” Backsplash on back wall. Countertop to overhang on sides only 1/2” to not touch side walls. 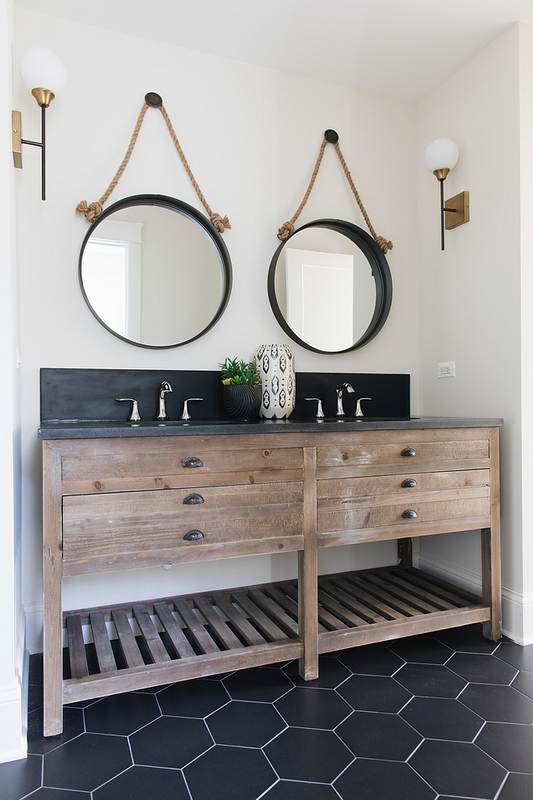 Vanity is from RH – see more reclaimed wood vanities here. Lighting is Visual Comfort – Extra Large. Classic Gray OC-23 by Benjamin Moore wall paint color with Simply White by Benjamin Moore trim paint color. Timeless color combination! The master bedroom has a beautiful tray ceiling. Instead of the typical expected application of grey on walls and white on the ceiling, the designer wanted to switch it around. 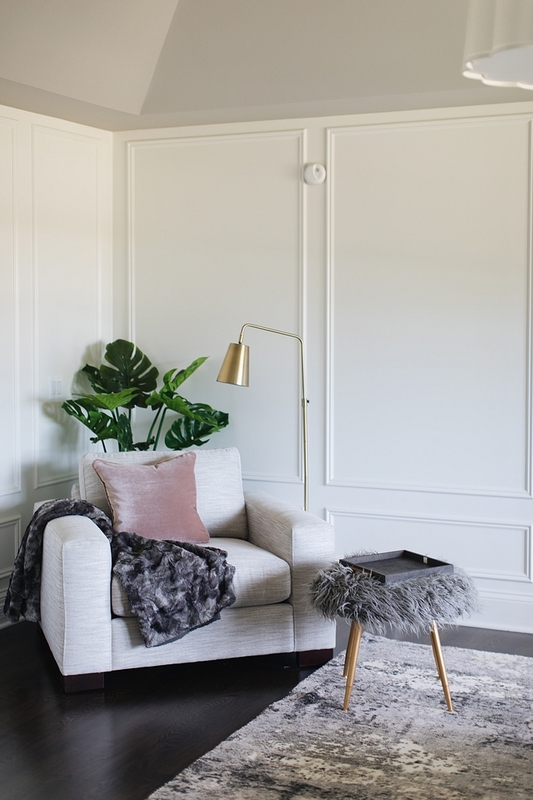 She added panel molding to the walls and sprayed the whole room Benjamin Moore Simply White. Then she painted the ceiling Ozark Shadows by Benjamin Moore (her favorite true grey paint color). 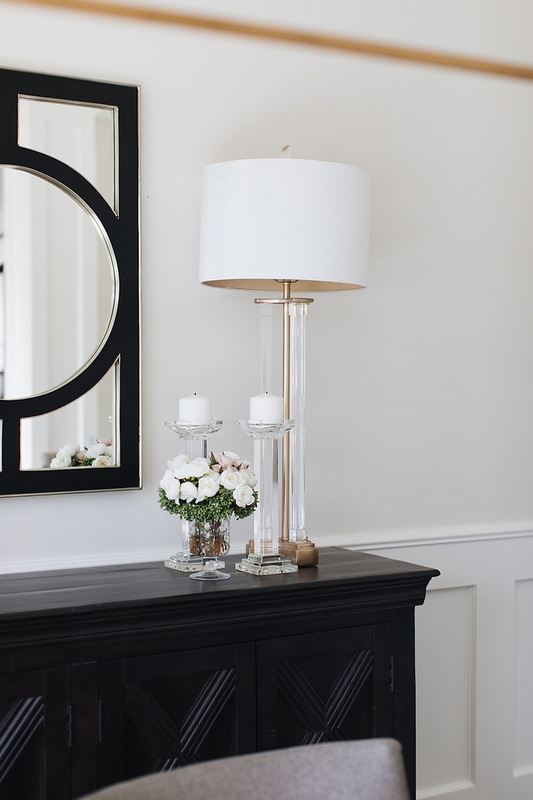 The beautiful ivory shade light fixture completes the room. Similar Channel Tufted Bed: Here & Here. 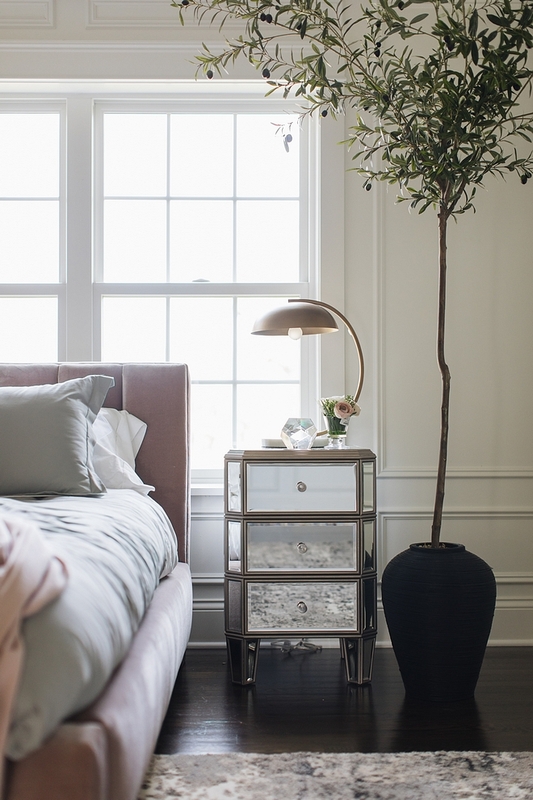 Bedroom features a grey and blush color scheme. 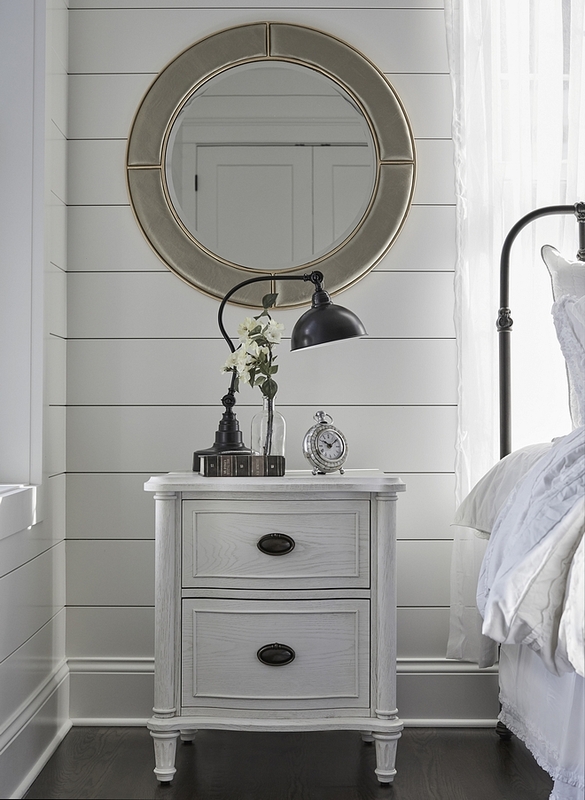 Similar Mirrored Nightstand with Drawers: Here, Here & Here. 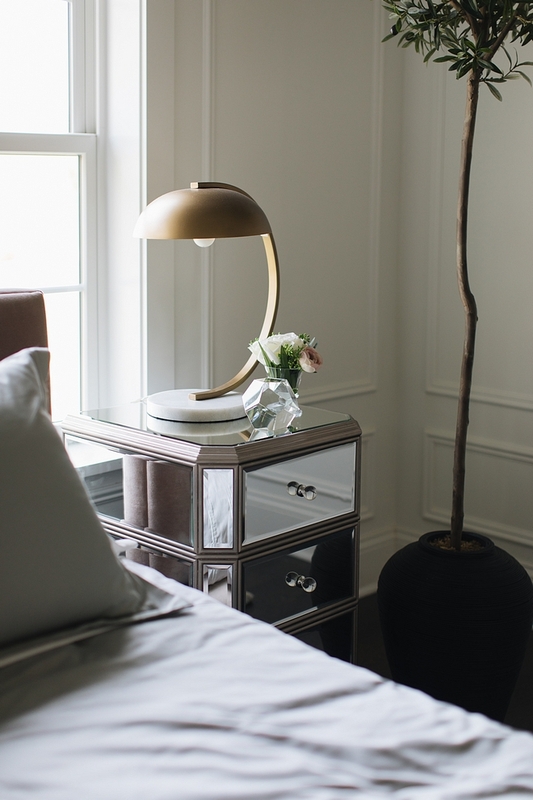 Bedroom Brass & Marble Table Lamp: Surya. Faux Fur Bench (2): Here. 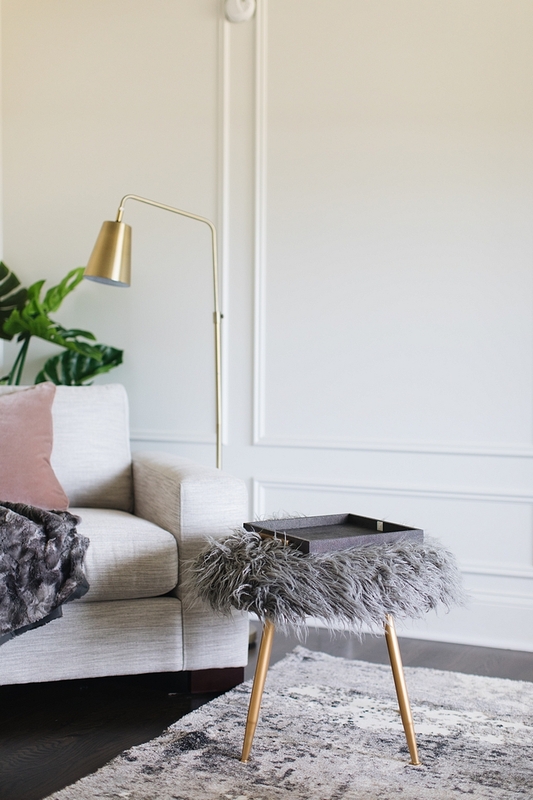 Similar Blush Velvet Pillow: Here. 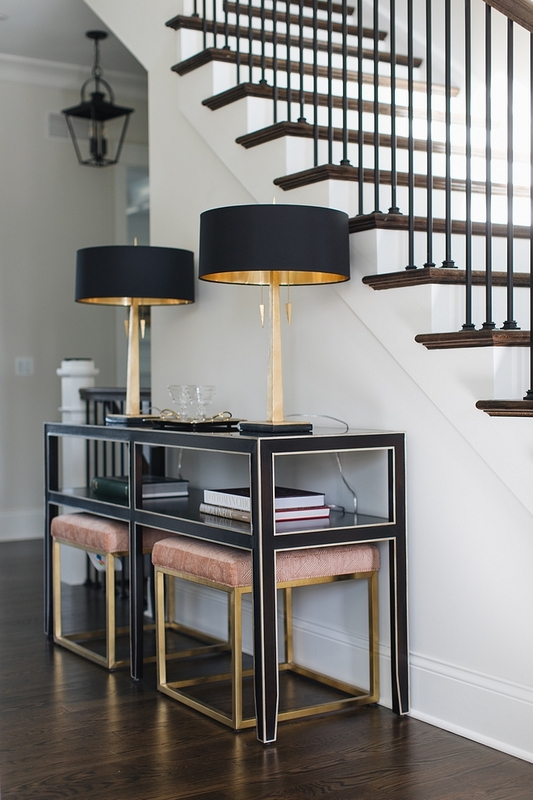 Similar Brass Floor Lamp: Here. 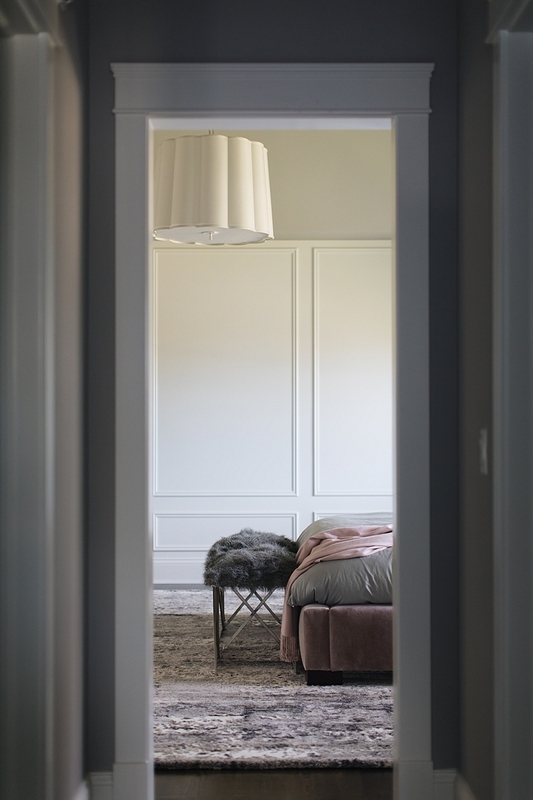 Master Bedroom Lighting: Visual Comfort. 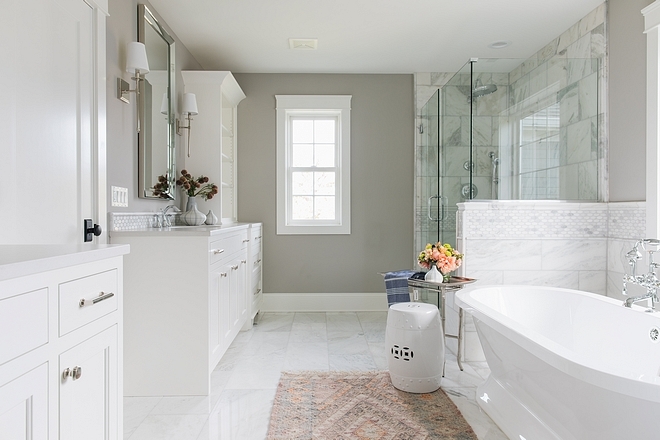 The master bathroom is opulently covered in Carrara marble. 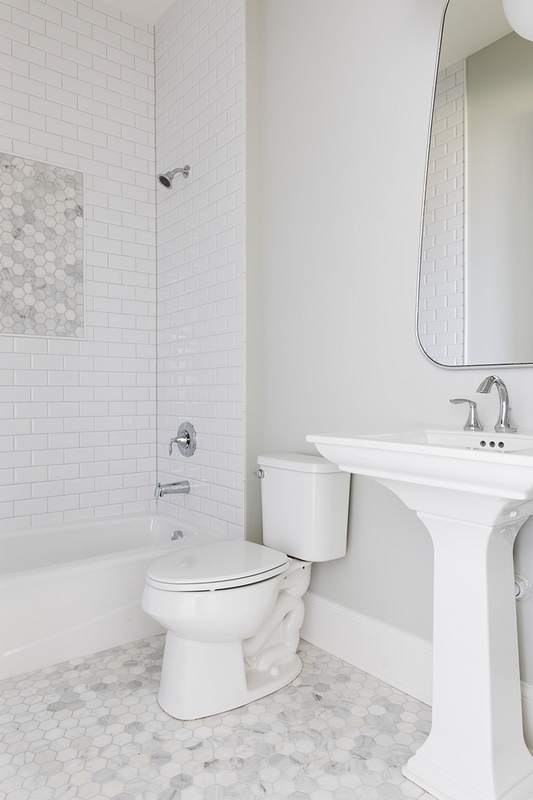 To add some fun, the designer added an oval penny tile in Carrara as a border. 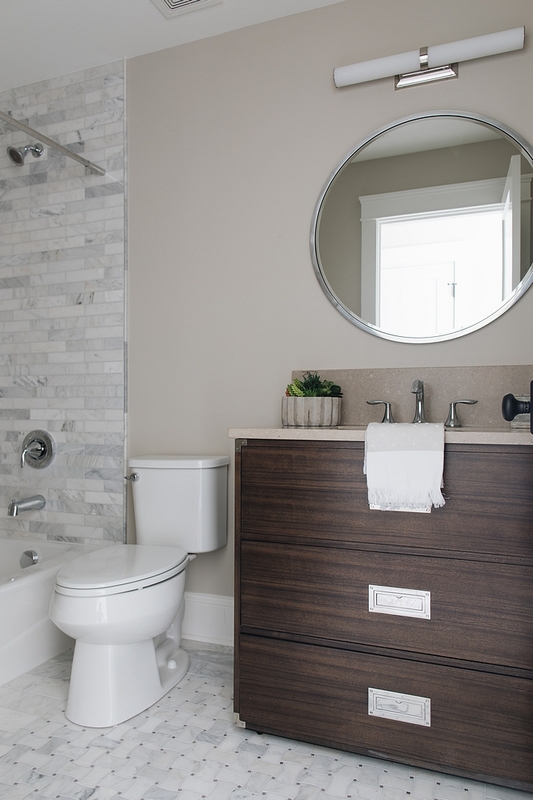 Hardware is from Schuab – Pulls & Knobs in Polished Nickel. 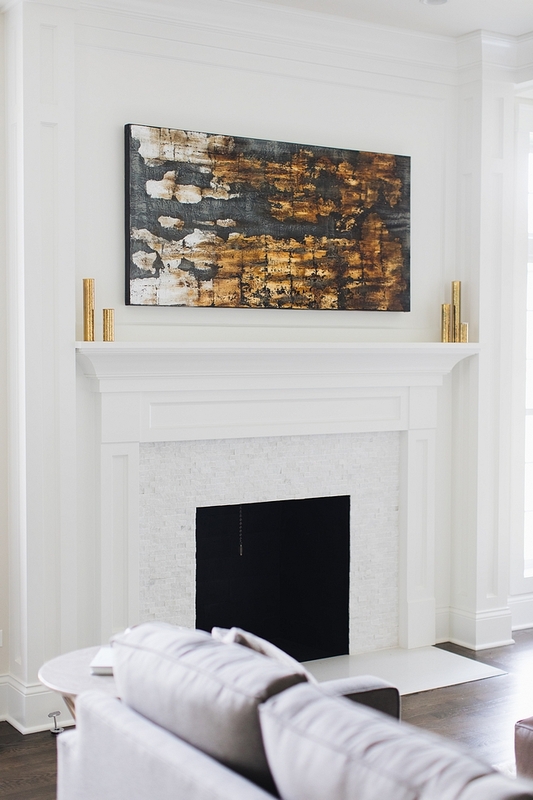 Ozark Shadows AC-26 Benjamin Moore looks stunning with white marble. The cabinets are custom made with easy access shelving great for baskets that can be stored away and pulled out easily. 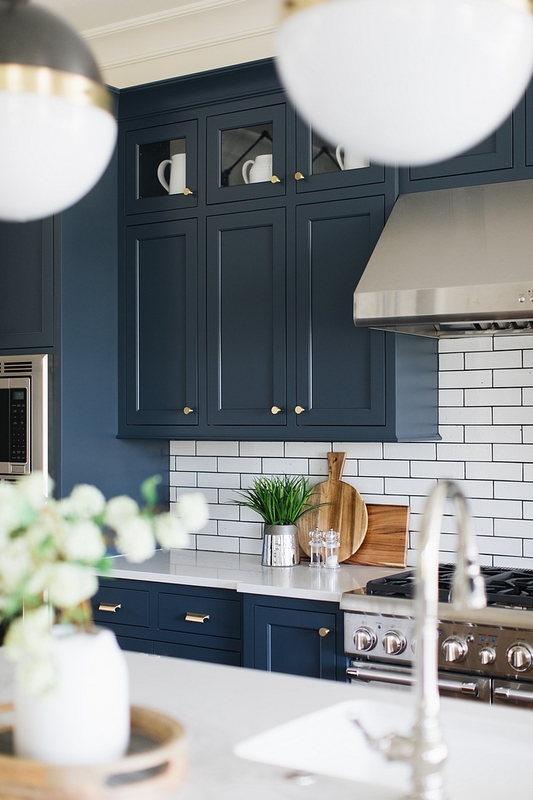 Cabinets are painted in Benjamin Moore Simply White. Countertop is Misty Carrera Honed. Ceramic garden stools can be found here. Silver Tray Table is Regina Andrew – similar here. Serena & Lily: Friends & Family: Get 20% off everything with code: HOMELOVE ! !